Boasting 200 acres of green space, Battersea Park is well known for hosting events such as The Decorative Antiques & Textiles Fair, as well as for its boating lake and children’s zoo. But it has not always been a venue for family entertainment. Prior to 1846, the area was known as Battersea Fields and was a popular spot for those who wanted to duel. The most famous of these battles occurred when the Duke of Wellington met with the Earl of Winchilsea to settle a matter of honour in 1829. During this period, the area the park now sits largely consisted of low, fertile marshes. There was also a pottery, lime kiln, chemical works and even early-stage railways along the riverside. The Red House Tavern was situated where Battersea Power Station now exists - a raucous drinking hole frequented by the likes of author Charles Dickens. It can be argued that drinking in the tavern was more dangerous than duelling, particularly when the history books reveal that neither the Duke of Wellington nor the Earl of Winchilsea were injured in their battle. 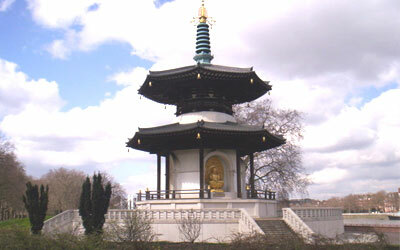 The decision to create Battersea Park was taken to stamp out the illegal racing, drinking and gambling that took place in the Red House Tavern. In 1846, the government passed an Act of Parliament that enabled the Commissioners of Woods and Forests to lay out a royal park at Battersea. The authorities turned to James Pennethorne, who was already responsible for designing Regent’s Park, to draw up plans. He used 750,000 tons of material excavated from Surrey Docks to raise the level of the site, although at low tide it is still possible to see how much the river embankment has been raised to create the park. In 1854 the carriage drives, lake and mounding were designed and built by the first park superintendent, John Gibson. But it was not until 1858 that Battersea Park was officially by Queen Victoria. In the second world war, the park was used to protect London from enemy air raids. Shelters were dug and much of Gibson’s creation was turned over to allotments for vegetables, and a pig farm was set up. In 1951, the Pleasure Gardens were built, as part of the Festival of Britain celebrations. Key features included the Guinness Clock and the Far Tottering and Oyster Creek Branch Railway. This was a major part of the park’s transformation. The most spectacular ride was The Big Dipper – a rollercoaster which opened in 1951. Unfortunately it suffered a fire in 1970 and was later closed after five children were killed during an accident when one of the trains became detached from the haulage rope and rolled back into another train – the worst accident in theme park history. In 2002-2004, the park underwent an £11m refurbishment – this was partly funded by the Heritage Lottery fund – and was re-opened by Prince Phillip. A sculpture was also unveiled here by Mayor of London, Boris Johnson in 2011; to commemorate the 10th anniversary of the 9/11 attacks on the World Trade Centre in New York. More recently, in 2012, the park hosted one of the seven national ‘Foodies Festivals’, with masterclasses from top chefs such as Ed Baines and Levi Roots. Battersea Park is an enormous draw for locals and tourists alike, and is absolutely vibrant in summer, with plenty to see and do. It’s a chance to enjoy one of London’s most prominent parks in the sunshine, so make sure you don’t miss out.